Blazon: A Gull volant Or carrying in the beak a Flash of Lightning Gules. Link: The badge represents the destruction carried to the enemy across the sea. Motto: Latin: Ad libertatem volamus – We fly to freedom. 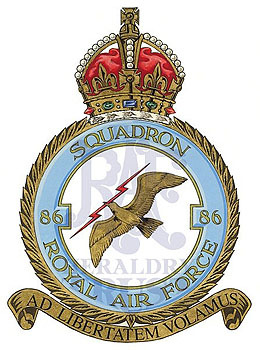 History: Formed at Shoreham on 1 September 1917 and finally disbanded at Oakington on 25 April 1946. Sponsored by Ivon Nigel Moore and dedicated to all who served with No 86 Squadron.